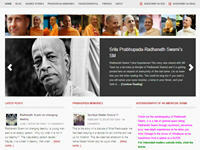 A website prepared to share the many benefits received from Radhanath Swami, innumerable other Hare Krishna devotees & Srila Prabhupada’s books. Here you will find a fraction of a drop of the ocean of spiritual insights, humorous quips, philosophical remarks, videos, and everything else of Radhanath Swami that can potentially uplift yourself. Category Sannyasis June 17, 2012 by ISKCON Desire Tree.